Drain your tofu block and place in a bowl. Now with your hands break it all up into a scrambled texture. Just keep squeezing it through your hands until it is well scrambled. Heat up your sesame oil in a frying pan and add your onions with a good pinch of fine sea salt. Fry on a medium heat until they turn translucent. Now add your carrot stick and kale leaves and with a spatula in each hand begin to mix it all together really well. Add ¼ cup water and keep mixing so that the veg begin to steam in the high heat. Keep stirring and mixing until the kale leaves begin to wilt and the carrot sticks soften. 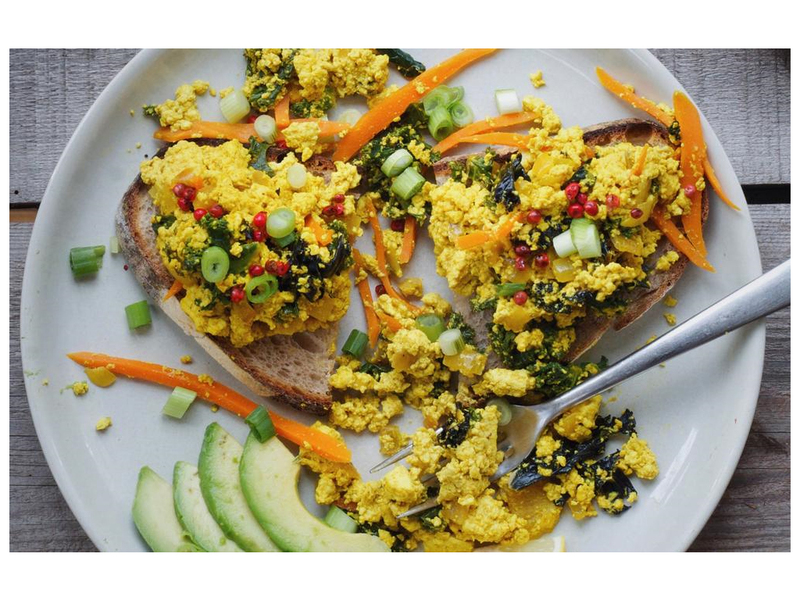 Now add your tofu scramble and add another pinch of sea salt and your turmeric and curry powder spices. Mix everything really well together. Keep folding everything in to that all the tofu is well coated in spices and the veg is mixed in well. If it gets too dry add a little water to allow it to steam and soften. Once everything is mixed in well and the tofu is softening add your tamari and mix in well. After about 7min of cooking add your lime juice and ginger juice and mix in well. Turn off heat and serve with fresh spring onions on top.